MANILA, Philippines - Four of the leading schols in the Philippines made it to the list of top 300 universities in Asia as announced by education firm Quacquarelli Symonds (QS) on Wednesday, June 10, 2015. 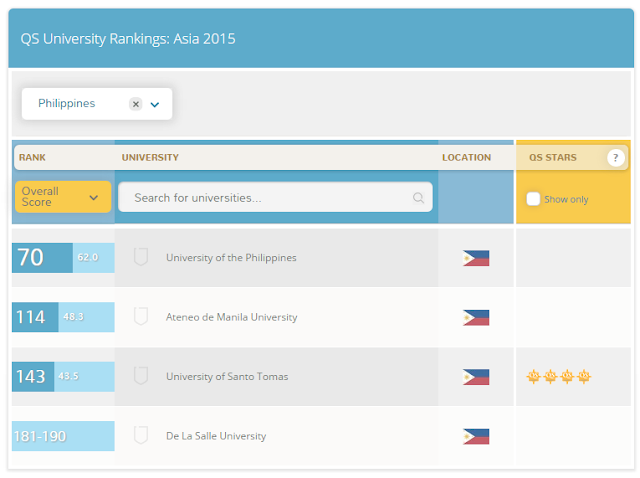 Among the four, the University of the Philippines (UP) led the pack as it was ranked 70th in 2015. The state university dropped by seven places from rank 63rd in 2014. The Ateneo de Manila University (ADMU) improved by one place from 115 to 144 this year. Following in rank 143 is the largest catholic school in the world and oldest university in Asia University of Santo Tomas (UST). Roman Catholic school De La Salle University (DLSU) ranked 181-190. Both UST and DLSU made no improvement in rankings in 2015. Published annually since 2009, the QS University Rankings in Asia features the the top universities from 16 countries throughout the region. Using a methodology based on nine performance indicators, the ranking facilitates comparison of Asia’s leading institutions on factors including global reputation, research production and impact, and internationalization. The nine indicators used to compile the QS University Rankings: Asia are as follows: academic reputation (30%), employer reputation (10%), faculty/student ratio (20%), citations per paper (15%), papers per faculty (15%), proportion of international faculty (2.5%) and proportion of international students (2.5%), proportion of inbound exchange students (2.5%) and proportion of outbound exchange students (2.5%). This year's Top 10 schools in Asia are National University of Singapore, University of Hong Kong, Korea Advanced Institute of Science and Technology, Nanyang Technological University, Singapore (NTU), Hong Kong University of Science and Technology (HKUST), The Chinese University of Hong Kong (CUHK), Peking University, Seoul National University, City University of Hong Kong and Pohang University of Science & Technology (POSTECH).